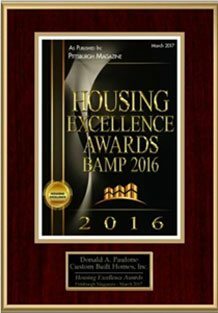 In December of 2106, Donald A. Paulone Custom Built Homes, Inc. was awarded the 2016 Housing Excellence Award from BAMP (Builders Association of Metropolitan Pittsburgh) for the Best Single Family Attached Home of the Year under $300,000. The showcase winner is a ranch-style villa at The Villas at Grayhawk condominium community just east of Westmoreland Mall. Winners were judged on the use of materials and space, interior design, exterior design, and curb appeal.